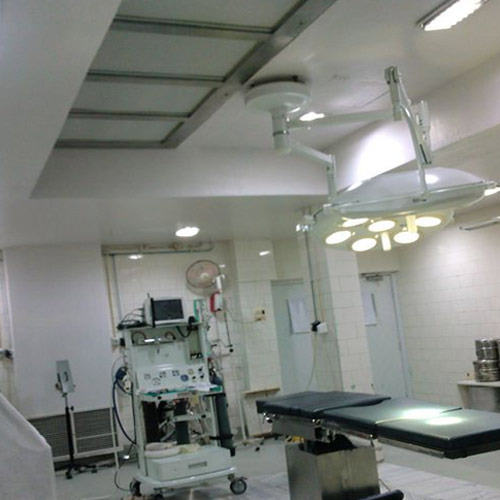 We are a leading Manufacturer & Exporter of Hospital Equipment such as Grossing Station, Scrub Station, Modular Operation Theaters, Ventilation System and Air Flow System Operation Theater from India. 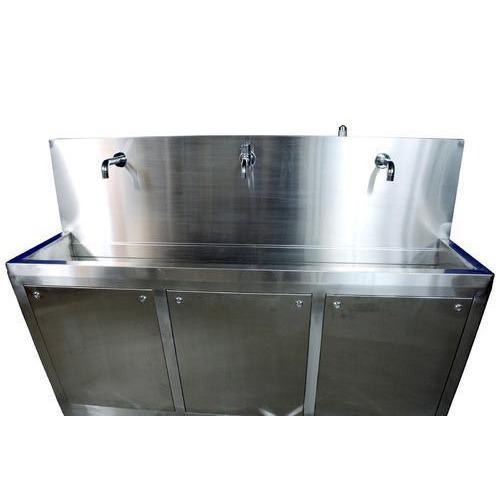 Scrub Station are constructed of 1.2 thicknesses, type 304 stainless steel with horizontal and vertical corners coved to ¼” radius. Front corners are to be welded and all welds ground and polished to MAT finish. Sinks shall have sloping basin to eliminate back splash. Each station shall be equipped with 1.5” stainless steel drain. Outer enclosure is constructed of 18 gauge stainless steel and having removable stainless steel access front panels. Soap bottle shelf will be located behind panels when optional soap dispenser pump is specified or required by you. Scrub Station contain a digital timer to control water flow. The scrub cycle is activated by pressing the 1, 3, 5 or 10 minute cycle pad followed by the start button. Digital time is displayed in seconds as time elapses. Solenoid valve will open and allow tempered water to flow for selected cycle period. The digital timer also contains an “Abort” button to terminate the scrub cycle prematurely. 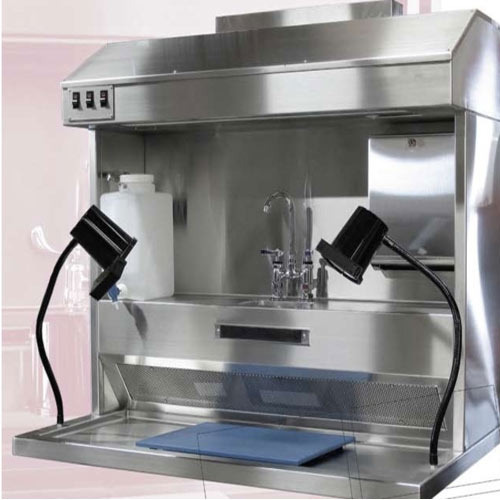 Scrub Station are supported by in-wall chair carriers or a stainless steel pedestal base. Owing to our in-depth domain expertise, we are providing a qualitative range of Grossing Station that is used for testing and sectioning of specimens in Pathology Departments. The offered station is manufactured as per international standards using the best quality components under the guidance of our expert team. Our offered range is available in different specifications to fulfill the wide needs of our esteemed clients. In addition to this, clients can avail the entire range of station from us in customized options and at market leading prices. 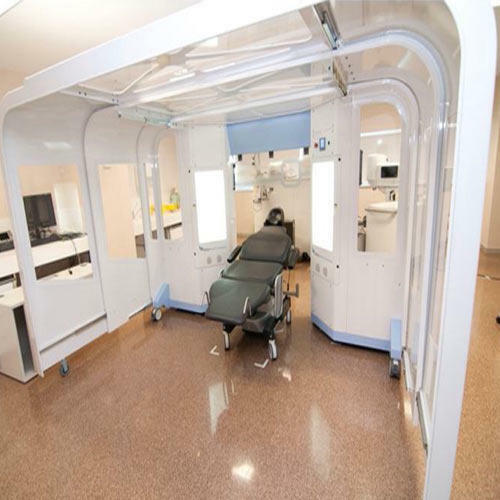 We hold all the aces in designing and developing the best Modular Operation Theaters. To meet diverse requirements of our prestigious clients, we are engaged in providing an excellent range of Ventilation System. This system effective ventilates corridors and operations theaters of the hospitals. Only high quality components are used while manufacturing the offered system, for increased compliance with industry standards of quality by our experts. The offered system is highly appreciated among clients for its high performance and compact design. Apart from this, our range is offered in different specifications and can be customized, as per precise needs of our clients and at highly competitive prices. 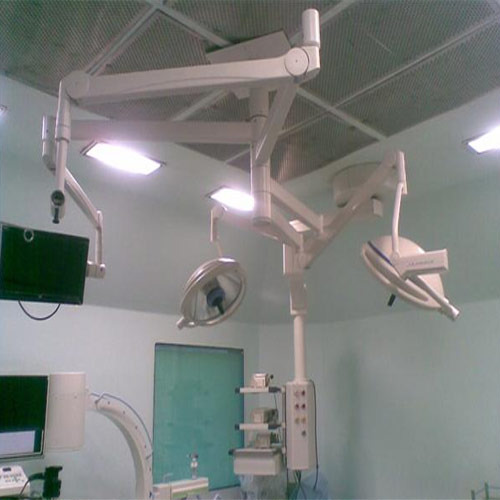 Our expertise lies in designing and developing the best Air Flow System Operation Theater. This range we offer Laminar Air Flow System, Pass Box and Air Shower. Manufactured using high-grade basic material, these products offer effective performance and longer serviceability. Furthermore, to cater to the divergent demands of the clients, we offer these products in variegated technical specifications.